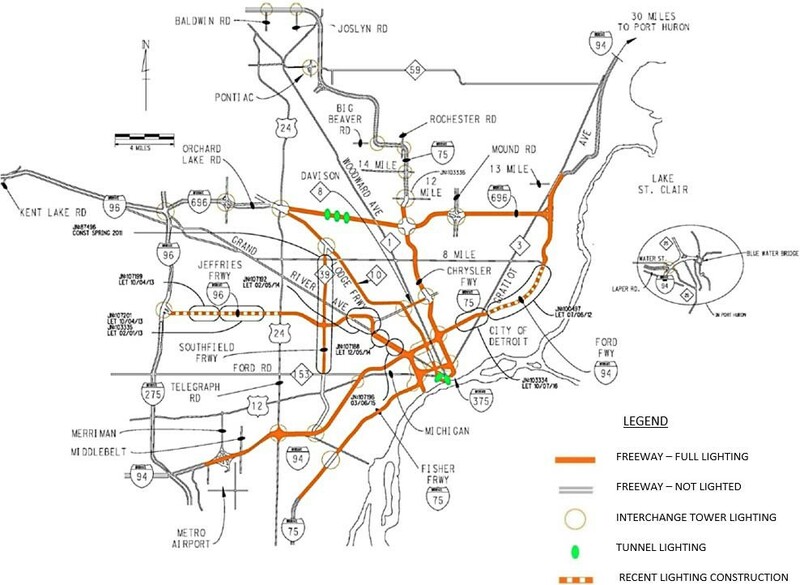 See the freeway lighting system map. According to the Michigan Department of Transportation (MDOT), funding shortages, copper theft and other problems had caused a 30 percent drop in the number of functioning lights on freeways in Macomb, Oakland and Wayne counties. To address the problem, MDOT entered into an innovative Public-Private Partnership (P3) with Freeway Lighting Partners, LLC (FLP) beginning in August 2015. FLP was charged with upgrading and maintaining freeway lights in Macomb, Oakland and Wayne counties for a period of 15 years. The goal of the P3 was to first install, then operate and maintain high-quality freeway illumination to provide the traveling public with improved visibility, safety and personal security. It is the first P3 in the country aimed at improving freeway lighting. The project has improved the lighting infrastructure, enhanced safety, is achieving energy savings using new technologies and creating efficiencies by transferring maintenance risk and responsibility to FLP instead of MDOT.. The P3 project is more cost-effective, improves budget certainty for MDOT and allows the department to devote its resources to other projects. The P3 partners bring experience, flexibility, innovation and the ability to take advantage of commercial cost savings. This in turn, maximizes return on investment and typically results in higher levels of service for the public at a cost that is not only lower, but also more predictable.